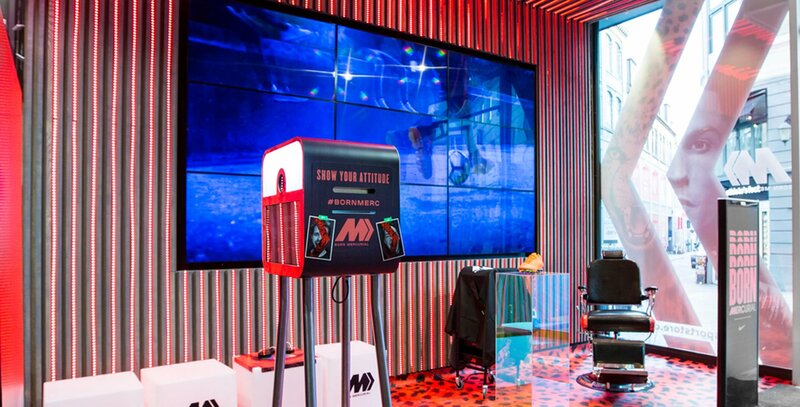 Home / News / Unisport Flagship Store x #BornMercurial | Get a fresh Mercurial haircut! Unisport Flagship Store x #BornMercurial | Get a fresh Mercurial haircut! The last couple of weeks have all been about the new Mercurial boots and being #BornMercurial. We have seen all the biggest Nike athletes wearing the boots, such as Ronaldo, Neymar Jr., Mbappé and many more! We are teaming up with Nike and a barber to give the Copenhagen youngsters the opportunity to experience the #BornMercurial feeling and to win their own pair of Mercurial boots! Our Flagship Store got a new makeover, and is turned into a real #BornMercurial area! You already get caught by the Mercurial fever when looking at the store from the outside, when seeing Ronaldo x Cheetah on the windows of the shop. When entering the Flagship Store you step directly into our initiative area. The floor is covered with a cheetah-printed rug, a photo booth is set up, and we also have a barber to give you a fresh and clean Mercurial cut. You could say that our Initiative Area is turned into a true #BornMercurial place. We got the talented Jermaine Bailey from Bailey’s Tonsorial in, so he can fresh up the youngsters with a new haircut. While waiting on your haircut, or admiring the job that Jermaine is doing, you can sit in the Initiative Area, and look at some of the awesome Mercurial products. After your fresh haircut you can take your own #BornMercurial picture with the photo booth, and showing your attitude with the tag #BORNMERC. Honestly, who hasn’t thought of getting their own Mercurial picture as the Mercurial athletes! Haven’t had time to visit our Flagship Store, or are you going on a visit to Copenhagen? Then stop by and experience the #BornMercurial feeling together with Unisport. Or browse through our pictures to get a sense of the #BornMercurial feeling. Want your own Mercurial boot? Then look at our Mercurial collection right here and find your next boot!